Watch Dholakpur and Pehalwanpur fight the stick to win the hockey title. The kids travel to different villages to find the hidden treasure to save their own village from drought. Have fun with the new jungle boy as he becomes Bheems friend. Chutki is delighted when she knows she is the queen of a lost village, but not for long, since she is forcefully made to live there. See how Bheem saves her from this mess. 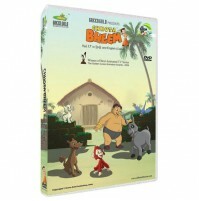 Also watch your favorite twin kids, Dholu and Bholu learn karate and challenge Bheem. So who wins? Watch this volume to find out!